Hope everyone is well. While I was putting the finishing touches on this card, my bright Ott Lite caught all the glitter at just the right angle and it actually made my eyes hurt for a second. There is a lot of glitter on this card! I managed to catch a photo of it radiating all its brilliance, but decided I wouldn't do that to your eyes. For this card I used my favorite Christmas Magnolia stamp - Silent Night Tilda. I stamped her on 300g hot pressed watercolour paper in a two step process. First I taped off everything but the flurries, which I inked up with embossing ink and embossed in silver. It occurred to me that I could have saved some time if I would have used a Versa Mark marker to colour in the parts I wanted to emboss, but unfortunately I do not have such a marker. It is one of the many items on my wish list. Then I inked up everything but the flurries with black Stazon. She is painted with Distress inks (boots - pumice stone and walnut stain, coat and mittens- black soot and milled lavender, dress, buttons and stockings - milled lavender, cheeks - tattered rose, hair - antique linen and walnut stain, poinsettias and ribbon- fired brick, leaves - forest moss, sky - black soot and weathered wood) and her skin was painted with a watercolour pencil. I added Star Dust Stickles to the trim on her coat and the centers of the flowers and glued on some glitter for the snow at her feet. The edges of the watercolour paper are inked with walnut stain and distressed with a distressing tool. A little bling was added to each corner to finish off the image portion of the card. It was matted and adhered with foam dots. The glittered lavender paper is from the Black and White Butterfly stack from Me & My Big Ideas. As the name implies, most of the stack is black and white, so this was the only lavender paper in the entire stack. I didn't have anything to match, so I ended up making my own matching paper for the strip on the bottom half. 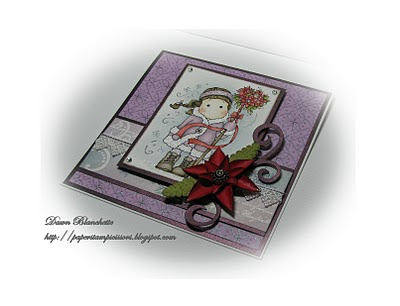 I started with white shimmery paper and used the Bo Bunny Midnight Frost stamp set. The stamps in this set are absolutely beautiful - however they are not photo polymer and do not stamp well. To ensure a good image, rub the stamp with a pink eraser prior to inking it up. I stamped the flourish and text stamps with embossing ink and embossed them with clear embossing powder so they would stay white. I then stamped several snow flakes in faded jeans and again embossed with clear embossing powder. I then used an ink blending tool to colour in the paper with weathered wood and milled lavender. I added a strip of lace and topped it off with silver cord. 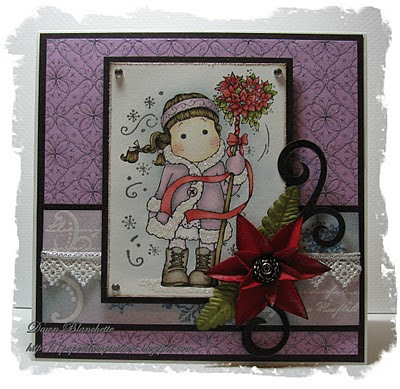 The white cardstock is Bazzill and the metallic 'sparkling merlot' card is from Creative Collection. Last but not least is the poinsettia. For this, I have to give credit to Tim Holtz. He gives detailed step by step instructions for making your own poinsettia on his blog here. For my card, I have used cardstock instead of the grunge/canvas mix he used. I also only used the two smaller flowers and made only two layers instead of the three he used. I added an extra petal to the inner layer (he only used 5 petals) and I used an antique silver brad from Stampin' Up in the centre. The leaves are from Magnolia and the flourish is from the Straight from the Nest Cricut cartridge. Thanks for visiting my blog! I look forward to your comments and I hope you enjoyed my Christmas card! oh this is just beautiful. 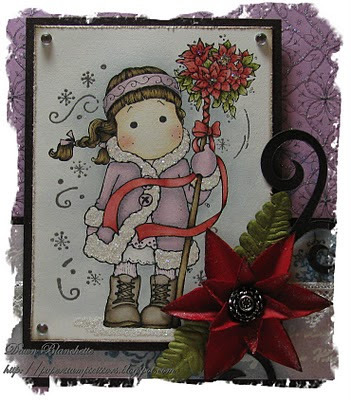 Not surprised this is your favourite Christmas stamp - how beautiful is she? jUst gorgeous. Love your flower and everything about the card. A real stunner. Such a beautiful card and I love the colours. Hi Dawn - this is a beautiful card and your poinsettis looks positively stunning! Thank you for sharing with us at Bah! Humbug!